Anyone on a diet…turn around. I was in the supermarket and spotted something I haven’t had for quite a long time. An item that instantly takes me back to fond memories of our family trips to France in my childhood. Brioche. Each morning, we would take it in turns to walk through the campsite we were staying at, to get to the shop/bakery. We would buy fresh pastries – my favourite choice was always Pain au Chocolat – and we’d walk back to our caravan with them. Oh the smell – there was nothing like it. It’s one of those smells that stays with you for life. 2) The amount of chocolate spread is totally up to you – as little or as much as you fancy! Spread on one side. 3) Finely slice the strawberries – again as many as you want, I used one per sarnie. 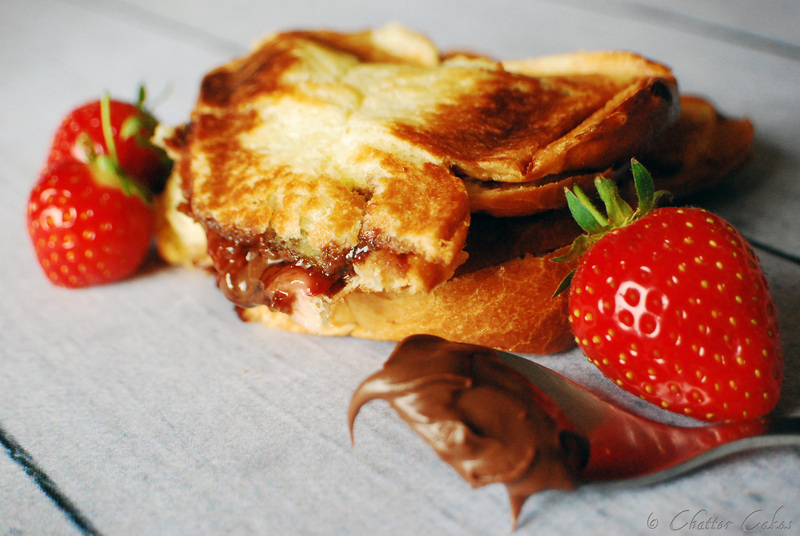 4) Place strawberry slices on top of the chocolate spread, and close up the sandwich. 5) Very lightly butter each side of the sandwich, so that it doesn’t stick to the toastie maker. 6) Pop sarnie into toastie maker and cook for around a minute. Best to check every so often, as the heat varies to machines. 7) Take out, and munch it!! So yummy, and comforting if you’re having that kind of day. I was today, so even though I only allowed myself a bite or two (the rest made its way to Mr CC’s plate), it cheered me up!